The Saints became just the third team in NFL history with 60 or more points, 200-plus rushing yards and 300 or more passing yards in a game last week. Brees (2,477 passing yards, 18 TD, 8 INT) was a big reason for that and passed for 300 yards for the sixth time this season. He finished with a rating of 144.9, and his 89 percent completion rate was the second-best single-game mark in Saints history and best by a quarterback with at least 20 attempts. Brees has also thrown a touchdown pass in 34 straight games, the third-longest streak in NFL history, and is two games shy of matching Brett Favre for second place on the list. Payton said after last week’s rout there are still some things the team can improve on, though that’s hard to imagine after a 62-7 blowout. In a 31-13 win over the Rams last season, Brees completed 25 of his 40 passes for 221 yards with three touchdowns and hit seven different targets. Rookie Ingram (329 rushing yards, 3 TD) posted a career-best 91 yards rushing on 14 attempts against the Colts, but his night was cut short after a heel injury. An X-ray taken after the game was negative, but he’s considered questionable for Sunday’s test. Sproles (289 rushing yards, 2 TD) has been a nice addition and is tied with tight end Jimmy Graham (674 receiving yards, 5 TD) for the team lead with 45 receptions. Top wide receiver Marques Colston (26 receptions, 374 yards, 3 TD) had a pair of touchdown catches last week. If tackling remains a problem for the Rams, then New Orleans will have its way for a second consecutive week. Indianapolis was torched in every phase of the game last weekend, and the Rams need to brush up on their studies this week to prevent that from happening to them. The idea is to get to Brees as fast as possible, though he has a quick release. Safety Quintin Mikell (38 tackles, 1 sack, 1 INT) stated the obvious, saying that if he and the team fail to make stops, it will be a long afternoon. Mikell, who had 10 tackles against the Cowboys, is second on the team in that category but like the rest of the defense, has had his fair share of misses too. Linebacker James Laurinaitis (47 tackles, INT) leads the squad in tackles and had eight last Sunday. Besides getting shredded by Murray on the ground, the Rams’ secondary will be in for a tough challenge. Colston seems back to his old healthy form and Brees said there’s so many weapons to choose from that it’s a different guy who comes through every week. King (30 tackles, 1 sack, 1 INT) may not play because of his groin issue, leaving more time for Gordy (7 tackles) and Hood to try to step up. Linebacker Brady Poppinga (20 tackles) is dealing with a calf strain and may miss the game as well. Defensive end Chris Long (11 tackles, 3 sacks) has seven sacks in last eight home games. Spagnuolo said he doesn’t want to force Bradford out there, but if the 2010 No. 1 overall pick is ready to go, the head coach will most likely listen. The Rams are having trouble putting points on the scoreboard no matter who takes the snaps, however, and Feeley (217 passing yards, 1 INT) was thrust into the spotlight for his first start since the 2007 campaign with Philadelphia last week. 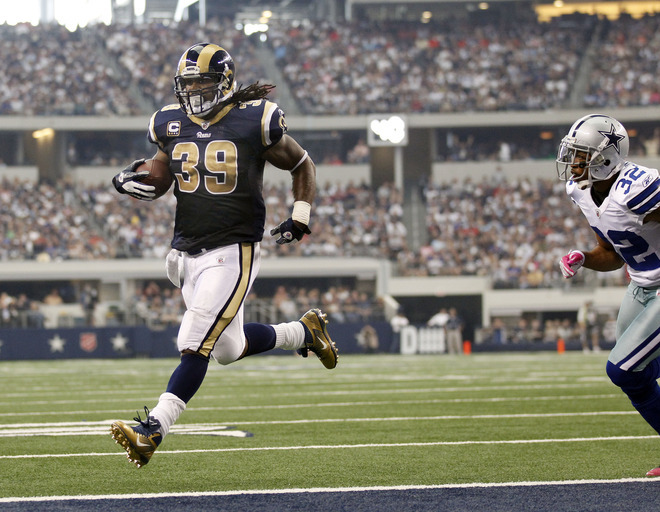 He was only sacked once by Dallas star linebacker DeMarcus Ware, with the Rams trying to take some heat off of Feeley by giving Steven Jackson (290 rushing yards, 2 TD) a season high-tying 18 carries in which he earned 70 yards and scored his first touchdown since a Week 1 loss to the Eagles. Jackson’s early-year thigh injury seems to be fine, but he is still searching for his first 100-yard rushing game of the season. In four career starts against the Saints, Jackson owns 400 yards and four touchdowns. Having played in the NFC South for a few years, Rams backup running back Cadillac Williams (220 rushing yards) has faced the Saints eight times, averaging 84.9 yards from scrimmage with a grand total of 679 yards. Wide receiver Brandon Lloyd made his debut with the Rams last week after a recent trade from Denver and caught six passes for 74 yards. Payton said he was pleased how his team never lost focus despite being up by so much last week. The Saints’ defense will try not to have a letdown on Sunday, and safety Roman Harper (42 tackles, 4 sacks) agreed with his head coach’s sentiments in saying there are things the team can still improve on. Harper leads the team with four sacks and the Saints recorded three on Bradford in last year’s meeting. New Orleans also posted a pair of interceptions in the red zone in that contest. It appears St. Louis will try to run Jackson wild against the Saints’ 15th-ranked rushing defense this weekend. The Saints gave up 155 yards rushing to the Colts, with rookie Delone Carter racking up 89 yards and a score on 10 carries. The Rams also have a new wideout in Lloyd, and he is a big-play guy. The ex-Bronco was re-united with offensive coordinator Josh McDaniels and could give the Saints’ secondary some issues. Torrence (11 tackles, 1 sack) returned an interception for a score last Sunday night, while linebacker Jonathan Vilma (29 tackles) had four total tackles and a first- quarter fumble recovery that set up New Orleans’ first touchdown of the evening. Linebacker Jonathan Casillas (14 tackles) had five tackles and one sack to give him three quarterback takedowns for the season, which ranks second on the team along with ends Will Smith and Junior Galette. It almost seems no matter who plays quarterback for St. Louis, this will be a tough challenge. New Orleans doesn’t boast one of the stingiest defenses in the league, but playing catch-up with its offense is something not too many opponents want to delve into. If St. Louis finds a way to suppress Brees and the Saints’ pass attack, can a hobbled Ingram and Sproles carry the load? The answer will likely be yes against the Rams’ porous run defense, but the likelihood of the Rams shutting down Brees also seems slim-to-none. The team that wins the turnover battle usually ends up with the victory. The Saints did not commit a turnover versus Indianapolis and are now 16-0 under Payton when playing turnover-free football. They are 19-2 when forcing three or more turnovers in a game under this current regime as well. While New Orleans is still 3-1 whenever Brees throws an interception this season, their latest loss came when he was picked off three times against Tampa Bay.